This design is a variation of an Order-1 Transmission Line Transformer described by Guanella in 1944. This type of balun is also known as a current balun as it tends drive equal but opposite currents on the wires of the balanced port. 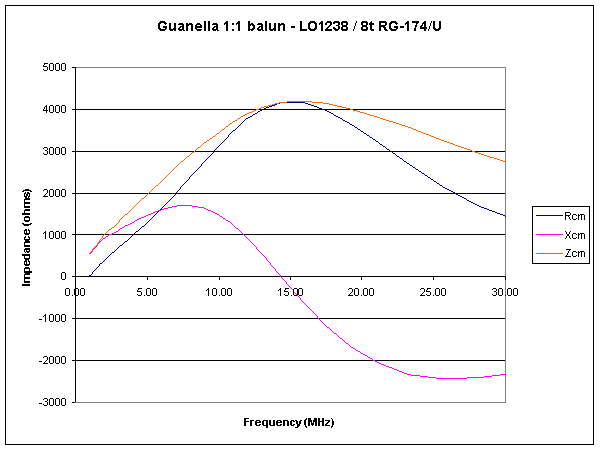 This article applies the lossy transmission line model described at A model of a practical Guanella 1:1 balun to such a balun made from a Jaycar LO1238 35mmx21mx13mm cores with eight turns of RG-174/U coaxial cable. The LO1238 cores are readily available in Australia, and at the time of writing retailed for A$4.50 for a pack of 2 cores. Fig 1 shows the common mode choke impedance for calculated from measured core characteristics. Quantity Zcm is the magnitude of Rcm+jXcm. The model includes 2.5pF of shunt capacitance to calibrate the model to a measured balun. The winding was a conventional configuration rather than the crossover configuration often used with these baluns. The crossover configuration might be convenient, but in this case the resonance was about 15% lower in frequency indicating higher stray capacitance. Fig 2 shows the VSWR and loss for the isolated balun terminated in a 50Ω load with the centre of the load grounded. Note that losses for other loads may be quite different, and this model does not attempt to include the effects of common mode currents coupled from an antenna radiator. 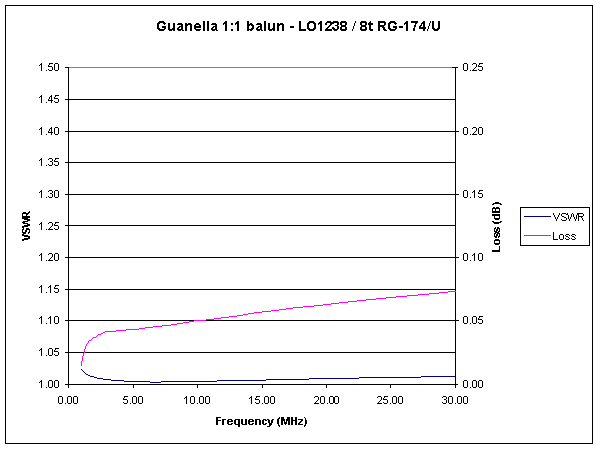 See A model of a practical Guanella 1:1 balun for more discussion of this topic. Table 1 sets out the choke impedance in the HF amateur bands for input to NEC models or the like. 1.02 07/03/2008 Revised with stray capacitance.